I feel like I’ve been spinning and knitting shades of brown for months. Coupled with the bleak, cold winter weather, I’m craving a bit of colour in my life. The depths of winter is not the ideal time to forage for natural dye material, but, in an uncharacteristically foresighted fashion, I managed to save and dry some plant matter in the summer when everything was growing rampantly, for just this eventuality. I have a common sage bush (salvia officinalis) in my herb patch that seems to thrive on neglect (my favourite type of plant). I hack it back several times a year in an attempt to shed some light on the weedy Rosemary that’s planted next to it. There is a limit to how much sage anyone can incorporate into their diet, but it seems a bit of a waste just to compost these prunings. In the autumn I bunched up a load of sage branches and hung them up to dry (people have generally stopped commenting on the nature and variety of organic matter in various states of preservation or decay in my house). It was this dried sage that I turned to in my hour of need. I’d had a decent result with fresh leaves in the summer, and so I was hopeful of a worthwhile result. 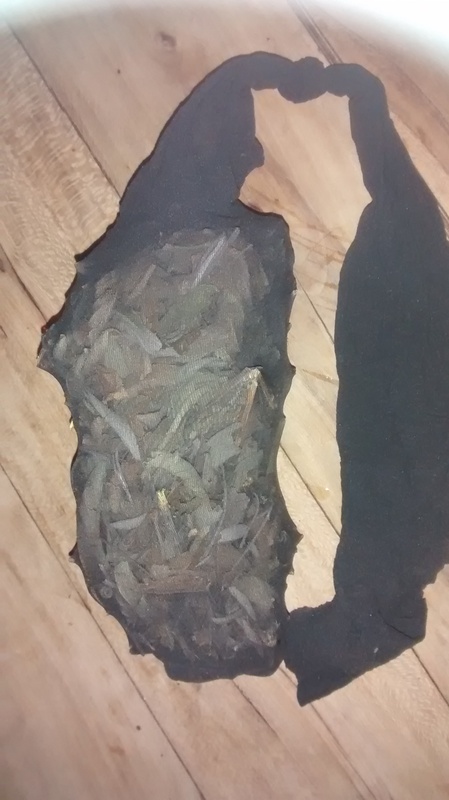 I weighed out 50g of the dried sage (mostly leaves, but a few stalks) and put it all into the leg of some laddered tights. I have two teenage daughters and consequently an infinite supply of laddered tights – they’re very useful, though possibly not in the quantity that they accumulate in this house. The tights package then went into my dyeing slow cooker, was covered with cold tap water and left on high for an hour or so, then turned to low for another couple of hours. 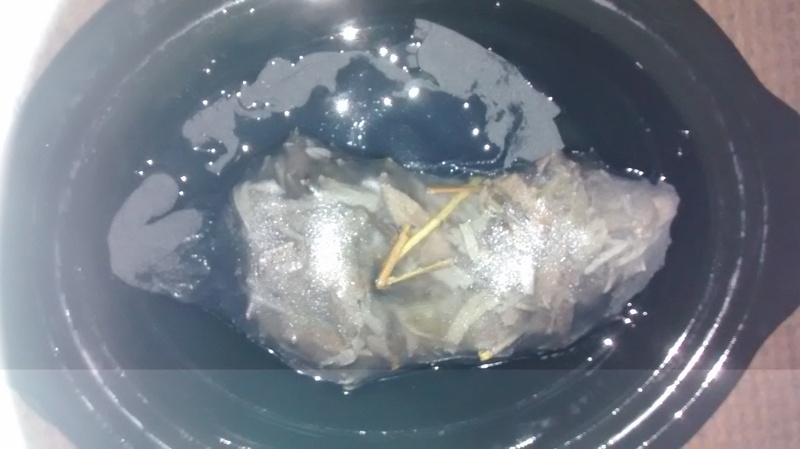 The water turned a brownish yellow, and after squeezing the cooked leaves out, the plant material was removed. Natural dyes need a mordant in order to fix to the fibre. 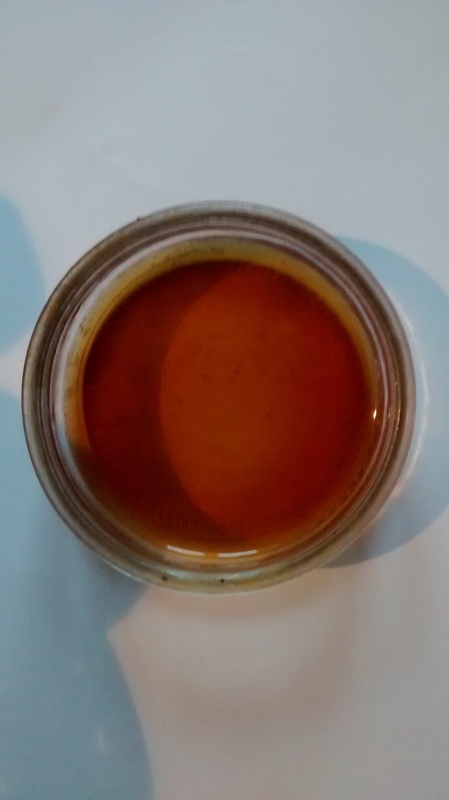 I decided to go for “simultaneous mordanting” by adding about a teaspoon of alum to the dye bath and giving it a stir. I would’ve added some cream of tartar too as this is supposed to help the take up of the alum, but I couldn’t locate my store of it at the crucial moment. 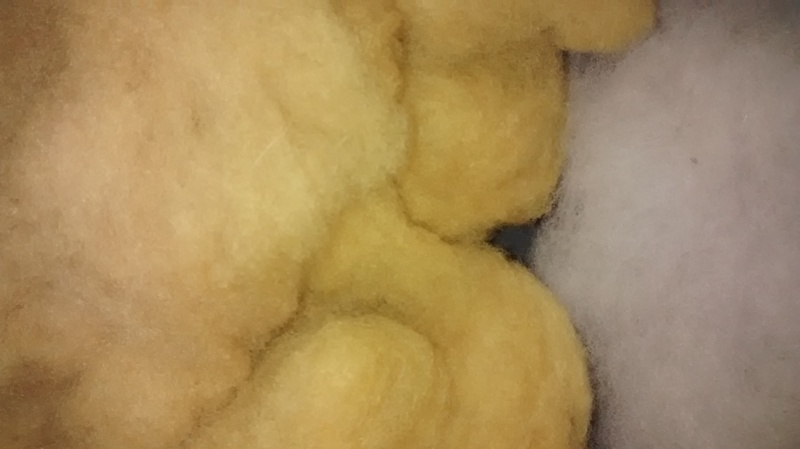 I used 50g of white Kerry Hill fleece that had been scoured and carded, and then soaked in hot tap water til it was fully wetted. Switching the slow cooker on to high again, I gradually raised the temperature to 87°c – this isn’t a magic number – it’s just what the slow cooker seems to heat up to. The fleece simmered at this temperature for a couple of hours and was then left to cool a bit in the pot before being rinsed, first in plain water, then in slightly soapy water. The result? Quite a nice greenish yellow, hard to describe and photograph accurately. I wouldn’t want an entire jumper this colour but I think it will make a welcome addition to a fairisle project or two. The exhaust bath yielded a paler yellow, again with undertones of green. 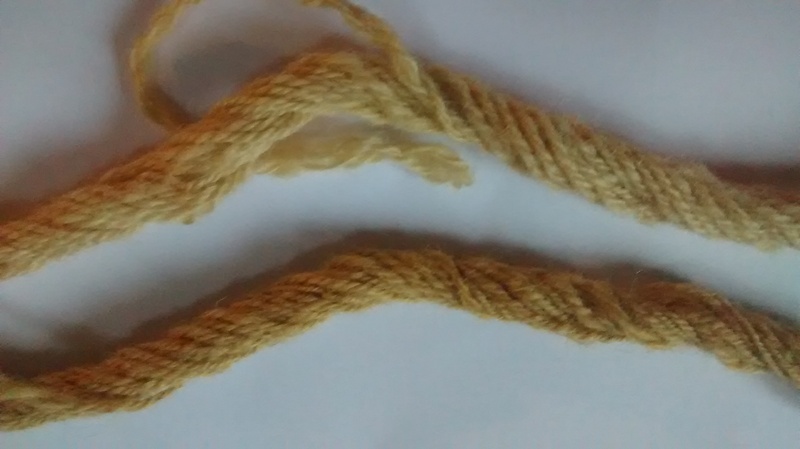 I spun up and Navajo plied just a single rolag of each for wash-fastness and light-fastness tests, and we must now all wait, on tenterhooks, for the results.